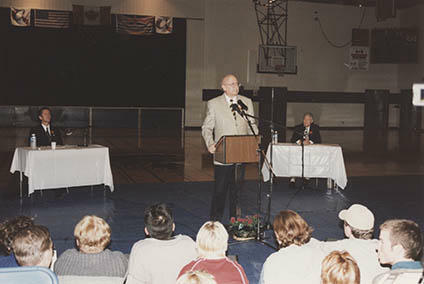 Photograph of Deane Downey moderating or taking questions during a debate between Svend Robinson, MP, and faculty member Paul Chamberlain. The latter are seated at tables, in the background. The debate likely centred on the topic of doctor-assisted suicide. Physician-assisted suicide.